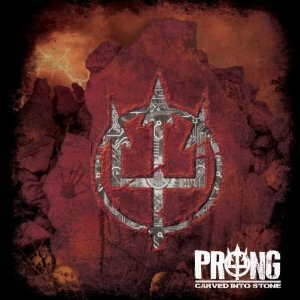 Hall of the Mountain King: Review: Prong, "Carved Into Stone"
I was less than impressed with Prong’s last outing, Power of the Damager. I preferred it to the more industrial stuff they’d been doing, but it hasn’t returned to my rotation in the nearly five years since it came out. I thought it was OK, but didn’t have a lot of passion or energy. So I approached the new record, Carved into Stone, with only moderate interest. Tommy Victor and Co. fixed my lack of interest with the first track “Eternal Heat,” which blasts out of the gate with a squealing, energetic guitar riff and pummels the listener over the head for about four minutes. The message at the end of the song is clear – the energy and fire are most definitely back. The big riffing continues on second track, “Keep on Living in Pain,” which definitely recaptures some of the feel of early records – Beg to Differ and Prove You Wrong. There’s a great memorable chorus on the song, which is something that was sadly lacking on Power of the Damager. First single “Revenge … Best Served Cold” kicks the catchiness up a big notch. It’s an energetic number maybe a little more in the vein of something off Cleansing with some alternative rock overtones mixing with the heaviness and some nice shredding thrown in for good measure. “State of Rebellion” also wouldn’t be out of place on Cleansing with that more mechanical style of riffing and just a hint of the industrial. The title track delivers a slinky, almost doom-like main riff. There’s certainly some Ozzy-era Black Sabbath influence in Victor’s verse vocals, and perhaps a nod to “Children of the Grave” on a galloping riff late in the song. The wavering backing vocals that are woven into the music on the chorus are also really cool in headphones. Basically, everything that Prong has done over its career comes together in some way on Carved into Stone, and it’s all done incredibly well. This is easily, in my mind, the band’s best overall work since Prove You Wrong. While Power of the Damager might have been a return to form in some ways, Carved into Stone is what you call a comeback album – and a damned good one.